The creation of the first shogunate, when political control in Japan switched almost overnight from the Emperor to the military overlords, occurred at the sea-battle of Danno-ura on 24 April, 1185 by the shores of the Inland Sea. The battle, the curtain call of the Gempei Wars, was between the Heike Clan, the ruling aristocracy of the Imperial Court, and the Genji Clan, themselves descendants of the royal line but thirsting for a return to power. The outcome was the routing of the Heiki Clan and drowning of the seven-year old Emperor to avoid capture by the rebel forces. On seeing his demise, the Heike army chose to follow their lord to their deaths and the samurai warriors leapt into the waters. And so, all the elements of a classic legend fell into place. A tumultuous battle, the death of an Emperor, the annihilation of his army, the self sacrifice of the courtiers and last but not least, no one left to contradict the story. 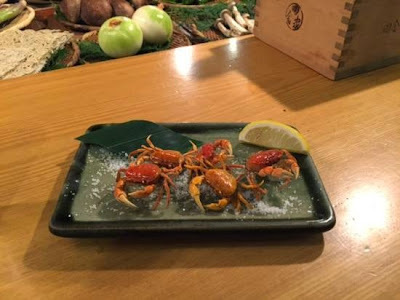 The legend itself relates to the Heikegani crab, native to the region of the Inland Sea and the Straights of Shimonoseki where the battle occurred and the Emperor is said to have drowned. The restless spirits of his army walked the depths in search of their lost empire, eventually taking the form of the Heikegani Warrior Crabs. These little beasts, no more than an inch or two across, are still caught today and when their distinctive, samurai like, markings are found, thrown back into the water to continue their journey. And then a modern urban myth arose. Or did it? Carl Sagan championed the theory (originated by Julian Huxley) that the crab's features were a form of accidental natural selection. Fisherman, seeing these characteristics, throwing the crabs back into the water and keeping (and eating) the more conventional looking crustaceans. Over the generations the features were re-inforced to the point that today the crabs do appear to resemble the samurai warriors of legend. However, there is a school of thought that cried foul. The argument goes that as the crabs are so small no one would eat them and this is simply an example of the human brain's ability to see a face in almost anything. Sagan and Huxley must be mistaken. And so we come to two important points. First, don't mess with a good legend, you never know if those warrior souls really are following you. And second, if you think they're too small to eat, go to Inakaya in Roppongi and order them. Who said you can't eat small crab. Carl Sagan, I'm with you on this one. YATTA! Walking the Yamanote Line - Done! Sherlock in Japan; Gulliver next?